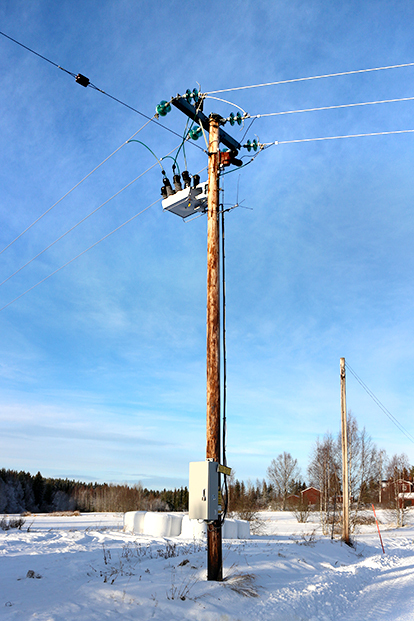 Australian Switchgear Engineering Firm NOJA Power in partnership with their Swedish Distributor Techinova have successfully achieved a Smart Grid rollout project near the town of Kisa in Sweden. Following the project rollout, the system was tested by Winter Storm Alfrida, as the region was buffeted by 110km/h winds. The following map demonstrates the permanent faults across the region, with the area in the black square designated as the Techinova/NOJA Power Smart Grid Network Region. After studying fault data of the last two years, Techinova developed a protection scheme with automation to improve network performance. The smart grid implementation developed by Techinova using NOJA Power OSM Reclosers was achieved using a combination of sectionaliser, Automatic Backfeed Restoration (ABR) and Voltage Reclosing Control (VRC) functionality. The protection capabilities in the NOJA Power OSM Reclosers allows for effective grading regardless of power flow direction, and when combined with NOJA Power’s Cos Phi algorithms for SEF protection the devices meet Swedish standards for High Impedence Earth Fault detection. This implementation was carefully evaluated by E.On on the basis of Project Time Schedule, Functional Value and Level of Automation. Following the project evaluation, the Techinova/NOJA Power Smart Grid was the only supplier to deliver the project on time, with a functional system, and with the highest level of automation of all evaluated systems. For further information on achieving a Smart Grid on the electricity distribution network or to learn about NOJA Power’s OSM Recloser system, visit www.nojapower.co.uk or contact your local NOJA Power Distributor.